Impressive fight from the Pokes last night in Fort Worth – watching TCU and Jamie Dixon last night had me thinking about Jamie Dixon coaching OKC Thunder’ Steven Adams at Pitt. I’m an Adams fanboy reading through his bio currently and it’s incredible. • A bit of a trend is developing around Cowboy Football – some players are transferring after being passed up on the depth chart. The second Cowboy in as many weeks has reportedly entered the NCAA transfer portal. Quarterback Keondre Wudtee announced that he was transferring from Oklahoma State a week after he put his name in the system. Now the Cowboys will face a hit in their offensive line depth for 2019. Thabo Mwaniki joins Hambright (Dylan Galloway) and Wudtee (Dru Brown, Spencer Sanders) in this scenario. You could read between the lines with guys like Patrick Macon and John Kolar but Darrion Daniels and Jalen McCleskey are a different story. 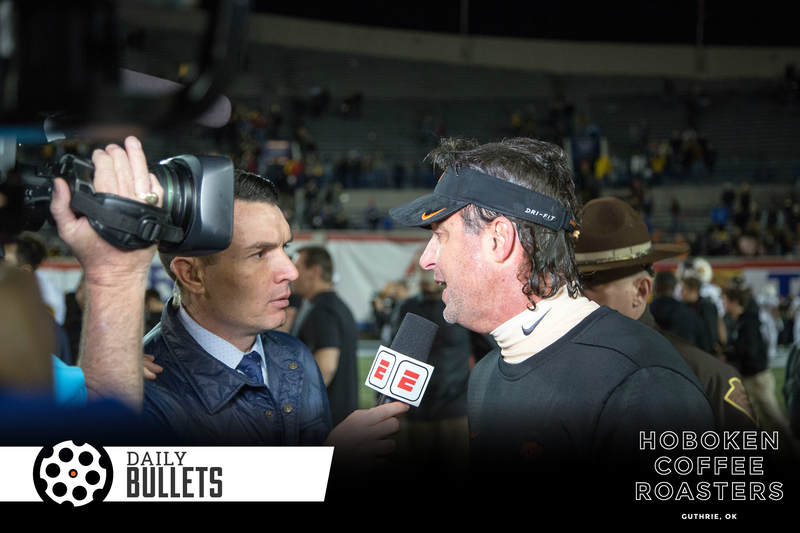 • Two things about OSU Football recruiting here – Mike Gundy has been great… but is that good enough? Whether you believe in Mike Gundy’s ability to go get top high school players or not, he’s gotten enough quality players to be a top-20 team in terms of winning percentage nationally since he took over in 2005. No coach is good enough to simply develop the talent necessary to sustain that level of success. You have to have some arbitrary number of dudes, and Gundy has met that level. • The highest impact player from this recently signed recruiting class may or may not be eligible to play in 2019. It still remains in question as to whether (Israel) Antwine will be granted a waiver by the NCAA to make him immediately eligible. He started all but one game for Colorado at defensive end as a true freshman last season, but left after the coaching staff was overhauled in the offseason. Clements and Co. have done a good job of having at least one of their two groups (between tackles and ends) capable of producing and leading the way while the other position reloads. This year will be the first time in a while where the Pokes will need to see three-plus rotation players emerge from the woodwork. • It’s sort of a defeatist-argument but Bobby A. explains the “I Heart Three Stars” goggles that OSU Football tends to wear in recruiting. There’s a moat, a wall, a barrier-to-entry around premier prospects that is apparently only scaled by a select few factors – being an NFL-factory at the prospect’s position, being their “favorite school”, being a blueblood program, or having some sort of close connection to the family. • Can’t say enough about how much I liked these signing day graphics from OSU this year – fun and great fit for OSU. The bowl game badge for captains’ uniforms of social media. • Bobby Stoops is back in football – if you classify a non-NFL professional league “football”. • Which condiments need to be refrigerated? • I’m here for Dennis Schroder as the sixth man.